Grains seeing some strength in the overnight session. Wheat up 2 cents, corn up 1 ½, and beans up 5 ½.
G20 Summit begins in Buenos Aires today. The US House Ag and Senate Ag committees say there is a deal in principal on the coming farm bill. For the month, Winter Wheat prices are down roughly 28 cents for HRW. Corn is down 3 cents. Soybeans up 37 cents. China is loading up on U.S. pork, despite import tariffs imposed due to the trade war, as a highly contagious swine disease continues to kill Chinese hogs. U.S. agriculture suppliers are stockpiling the Chinese chemicals that farmers need to kill crop pests and boost yields before tariffs on them more than double on Jan. 1. For the week ended November 22nd: U.S. All Wheat sales are running 13% behind a year ago, shipments 18% behind with the USDA forecasting a 14% increase on the year. U.S. Corn sales are running 16% ahead of a year ago, shipments up 82% with the USDA forecasting a 1% increase on the year. U.S. 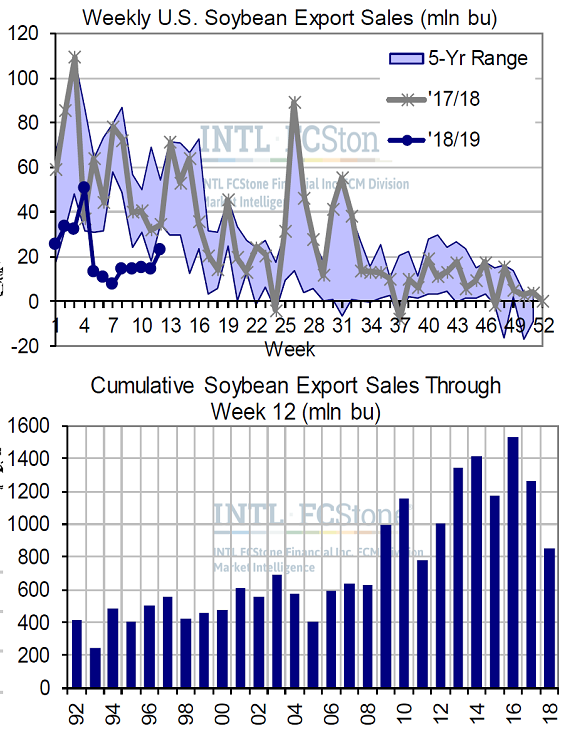 Soybean export sales once again “met expectations” this week at 23.1 million bushels, within a trade estimate range of 15-33 mbu, but that again left sales well short of the comparable total last season (34.6 mbu). Cumulative sales through almost one quarter of the 2018/19 season now stand at 855 mbu, down from 1261 mbu last year and still easily the slowest early pace since 2011/12. That gap vs LY is now up to 407 mbu, compared to the USDA’s current estimate for an entire-year 229 mbu soybean export drop.